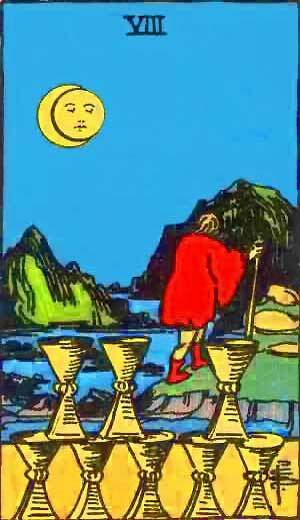 The Eight of Cups in a Tarot reading is about walking away from a disappointing relationship which is no longer of any concern and not as important as you first thought, its a matter of put it down to experience cut your losses and move on for something better. it means the opposite that you have found great joy and satisfaction. The card speaks for itself on the surface, but other readings are entirely antithetical–giving joy, mildness, timidity, honour, modesty. In practice, it is usually found that the card shews the decline of a matter, or that a matter which has been thought to be important is really of slight consequence–either for good or evil. Eight of Cups – A fair Girl, Friendship, Attachment, Tenderness. Note the Mercurial suggestion of the flying disk with its four wings, referring to the Qabalistic meanings of the number 8, Sphere of Mercury. First decanate of Pisces, February 19 to 28th, ruled by Jupiter and Neptune. Renunciation of material success for something higher; interest in psychical and spiritual things; strong emotions; charity and helpfulness; love of travel. Momentary success, but nothing lasting; over-impressionable; erratic and unsteady emotions; meaningless change of mood and purposeless journeying; querulous disposition. More information on the Eight of Cups Tarot card. This entry was posted in Tarot, Runes and Divination and tagged eight of cups, evil, feelings, harmony, love, mercury, tarot. Bookmark the permalink.